Authorities in Georgia have forcibly harvested over 33 tons of its citizens’ urine over the past eight years, jailing hundreds who tested positive for drug use, while coercing thousands of others into enduring humiliating procedures, according to opponents of the nearly decade-long war on drugs in Georgia. The rally was led by the White Noise movement, a coalition of drug users, human rights activists, physicians and psychologists. Taking its name from TV static, the campaigners aim to make noise until authorities decriminalize drug use and treat drug abuse as a public health, rather than a criminal, issue. The protesters scuffled with police as they blocked Rustaveli Avenue in the heart of Tbilisi. Georgia has had a zero-tolerance policy toward drug use since 2007, when the government led by then-President Mikheil Saakashvili, as part of its tough-on-crime agenda, introduced long prison terms for possession, and gave police the right to drug test citizens without probable cause. In 2014, for example, about 60,000 Georgians were tested. White Noise estimated the 33-ton figure based on the total tests since 2007 and the size of the sample cup. Public support for the tough approach remains strong. “Great, now junkies are holding rallies in the center of the city,” bristled one resident passing by the Tbilisi rally. 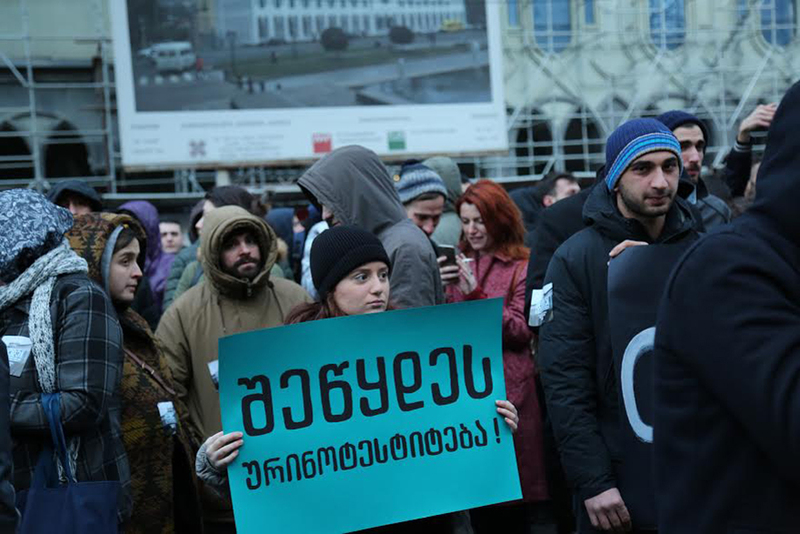 At the Tbilisi demonstration, and at series of smaller rallies leading up to it, activists called attention to the practice of police randomly drug testing citizens, one of the most controversial elements of Georgia’s war on drugs. The most notorious case involved Levan Abzianidze, a 56-year-old taxi driver from the nation’s second largest city of Kutaisi, who died last year after being forced to take a drug test. His family said that plainclothes policemen, posing as regular customers, flagged down Abzianidze’s cab and then ordered him to drive to a nearby clinic for drug screening. After failing to urinate, Abzianidze, who was in ill health, was allegedly administered diuretics that caused a sharp drop in his blood pressure. The tests found no illegal substances and Abzianidze was allowed to go home, where he recounted his ordeal to family members, and later collapsed and died. More than a year later, an official investigation has failed to identify the cause of Abzianidze’s death. The policeman involved was arrested on charges of abuse of authority and incitement to suicide, but activists say that such problems will persist as long as drug abuse is treated as a criminal offense. Studies have suggested that the war on drugs has backfired, showing a spike in intravenous drug use since 2007, the year when Georgia introduced its zero-tolerance policy. One study found that the rate of intravenous drug use in Georgia has almost doubled since 2007, reaching nearly 48,000 in 2014. “If nothing else, the prevalence of drug use in Georgia shows that the repressive anti-narcotics policy is not working, and has to change,” said Zurab Sikharulidze, a supporter of decriminalization and the head of Uranti, a substance abuse treatment center. Georgian activists propose taking a page from the experience of Portugal, which decriminalized drug abuse 16 years ago and has since reported a decrease in drug dependence and the spread of HIV and AIDS. It is unclear if the Georgian authorities will be supportive of the ideas proposed by the civil society groups. The current political establishment has in some ways moved away from the previous government’s tough take on crime. Many of the ruling Georgian Dream party’s members are hostile to the idea of decriminalization, arguing it will “destroy Georgia’s youth,” but the party’s leaders, including its chairman, Prime Minister Giorgi Kvirikashvili, indicated that they are open to discussions on more liberal approach toward drug use. Giorgi Lomsadze is a freelance journalist and a frequent contributor to EurasiaNet.org's Tamada Tales blog.